Nike’s epic “The Last Game”, Wii Sports Resort, Nexen Tire, Top Trumps. “There’s a good ball played in for Tony Morley…oh it must be…and it is…Peter Withe…Villa in the lead!”Hard to imagine as a ten year old Aston Villa fan commentating over a game of Subbuteo that one day I might actually make a living out of doing just that; being a football commentator voice over. Fast-forward thirty odd years and I’m asked by the son of Peter Withe to mimic those very lines from the 1982 European Cup final for a Villa football anthem. I could hardly say no could I? Have a listen. It turned out rather well. 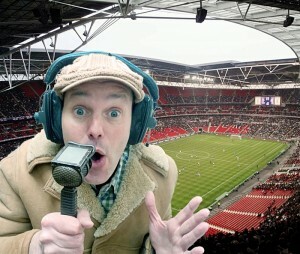 As one of the UK’s most widely used and most established sports voiceovers, I’ve worked as a football commentator voice for nearly twenty years now. As an occasional freelance live radio commentator for TalkSport, producers know they can rely on me as their go-to authentic sounding football commentator voice. You’ll hear my football commentator voice over work on anything from local radio ads and interactive projects to epic film productions such as Nike’s award winning ‘The Last Game’ film which aired globally for the 2014 World Cup. 110 million Youtube hits can’t be wrong. I was also the voice of Nexen Tires’ 2016 global tv campaign featuring Manchester City FC (both below). Other high profile TV credits include commercials for Wii Sports Resort and Top Trumps and countless others, including this 2018 World Cup promo session for UKTV Gold. I’m happy to record for you from my own professional home studio or equally happy travelling to a London studio for the recording. You can connect to me digitally and direct the session or leave me to self-record. I’ll then send you the edited, high quality audio in the format of your choice. One thing’s for sure, I know you’ll be ‘over the moon’ with the result.